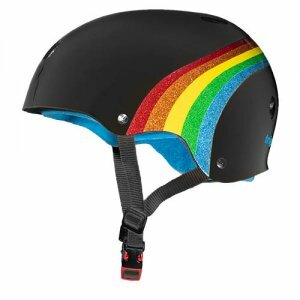 ﻿ Triple 8 Dual Certified Sweatsaver Helmet - Rainbow Black - $54.99 : Bruised Boutique, For Derby. By Derby. The first and ONLY certified Helmet with BOTH the deep fit and plush comfort of Triple 8's famous soft foam Sweatsaver liner AND High Impact-absorbing EPS foam that is Dual Certified to CPSC and ATSM safety standards. It's the holy grail of both comfort AND certified protection. More importantly, this Rainbow Glitter Helmet has sparkle for days! To ensure a perfect fit, measure the circumference of your head starting in the middle of your forehead and match it with the sizes below. Each helmet comes standard with two sets of inserts to accommodate both sizes.